Home of Handcrafted Model Ships, Nautical Decor, Nautical Gifts and Accessories. 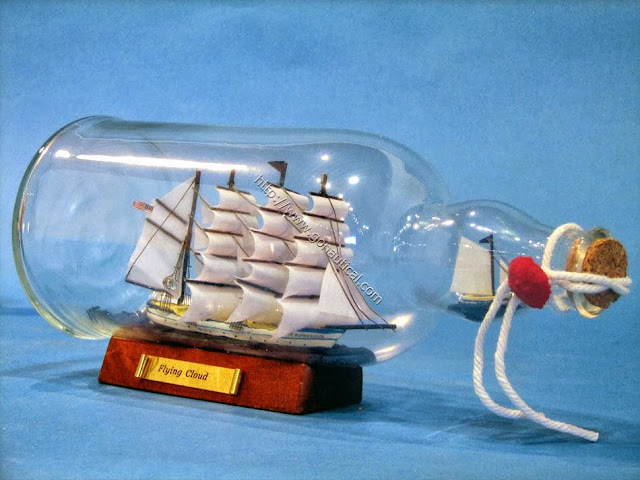 Posted by Unknown in Flying Cloud Ship, Ship in the bottle, Tall Ship "Flying Cloud"
HAVE YOU EVER WONDERED HOW ANYONE CAN POSSIBLY FIT A SHIP INSIDE OF A BOTTLE? Well, you can find plenty of long, detailed step by step guides on the subject. Or, you can actually watch the process of creation by a sailor who has dedicated decades of his life to perfecting this intricate art. This incredible short film shows Ray Gascoigne, an Australian sailor turned craftsman, in action. Ray talks about his craft and how it has changed over the years with new advances in technology. WHO THOUGHT TO PUT A SHIP IN A BOTTLE? The history is surprisingly simple. Model ships have been made for thousands of years with scrap material. However, it wasn’t until bottle making reached a consistent level of quality that sailors merged the two to create a craft that can not only pass the time, but also build a lasting work of art. Putting a ship in a bottle is a lot like solving a puzzle. Before you begin you have an idea of what materials you have to work with and how they will all fit together in the end. The shipbuilder aims to create a replica of a historically significant ship in the most accurate way possible. All the colors and details of the original ship are taken into consideration when choosing what materials to use in the recreation. There are two main methods of building. The first, involves collapsing the body of the ship enough to fit into the bottle and raising it once inside. The second method involves taking all of the pieces apart and then reassembling them inside of the bottle. While most people don’t devote decades of their life to honing this craft, watching the process and knowing a bit about the history can give you a better idea of what it takes to actually make a ship in a bottle and why people do it. The finished product is a work of art that not only celebrates nautical life, but also the craft of creating something meaningful by hand. Now for the real question. Will you ever look at a ship in a bottle the same way? 19th Century Racing Yacht "America"